Only two sleeps to go until the new Occasions Catalogue launches AND Sale-A-Bration begins! I love this time of the year! 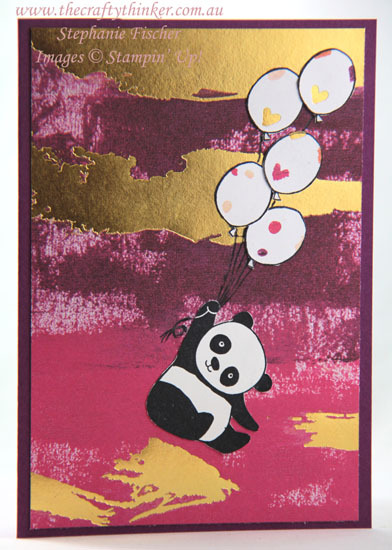 That stunning background is a piece of the Painted With Love Specialty Designer Series Paper. The balloons are also cut from one of those sheets. Even better - the panda is one of three in the Party Pandas stamp set (which also has some useful greetings) and it's FREE, yes FREE, from the Sale-A-Bration catalogue with a purchase of $90. 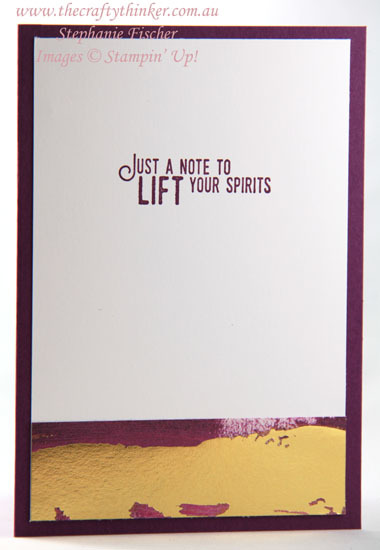 I made this card for one of my cousins who is going through a tough time at the moment, so I used a sentiment inside from the Lift Me Up stamp set, stamped with Rich Razzleberry ink.